All the ways in which you can unlock Power Crystals in the latest Power Rangers mobile game. One of the most valuable forms of currency in Power Rangers: Legacy Wars are Power Crystals. In the game, Power Crystals give you the ability to instantly open Morph Boxes, buy additional Morph Boxes, level up your Warriors, purchase Power Coins, and even purchase Zeo Shards in the Featured Warrior Shop. So, how can you earn more Power Crystals in Power Rangers: Legacy Wars? Complete achievements to earn more Power Crystals in Power Rangers: Legacy Wars. First, you can earn more Power Crystals in Power Rangers: Legacy Wars by completing in-game achievements. To view the list of available achievements, head to your home screen and tap on the star button located above the red “Battle!” button. You can view the list of available achievements by heading to your home screen and tapping on the star button. This will pull up your list of available achievements, such as upgrading a Leader to level 3. By completing this achievement, you will earn 10XP and 5 Power Crystals. If you scroll through the achievements, you’ll note there are many to choose from, giving you ample opportunity to earn extra Power Crystals. 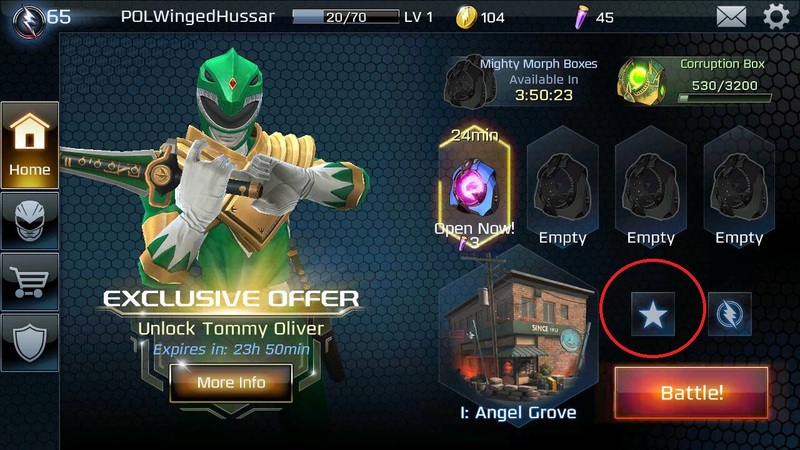 You can earn Power Crystals by opening Morph Boxes in Power Rangers: Legacy Wars. 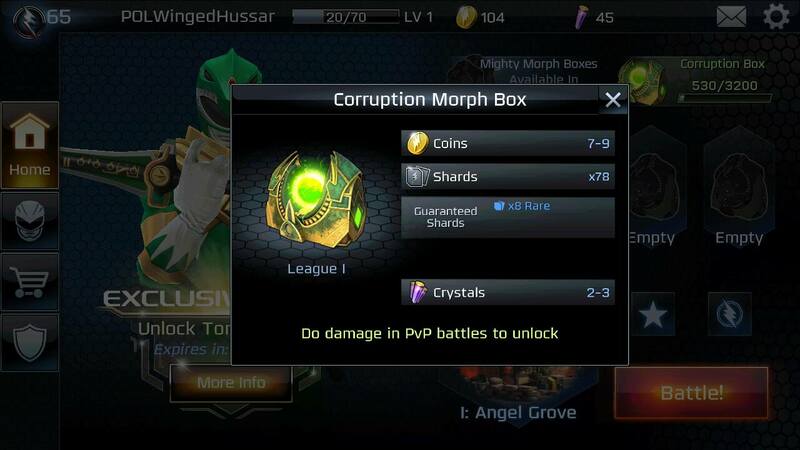 You can also earn Power Crystals in Power Rangers: Legacy Wars by opening Mighty or Corruption Morph Boxes. These Morph Boxes can be unlocked in a variety of different ways from logging in every 24 hours, to winning a PvP Battle. Once you acquire a Morph Box, you will need to tap on it to begin the process of unlocking it. 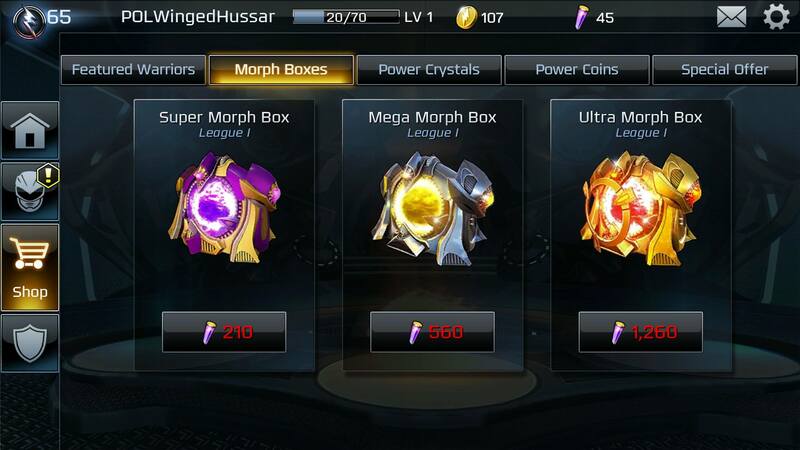 To instantly unlock a Morph Box, you will need to spend Power Crystals. As such, we recommend letting the Morph Boxes unlock on their own after a 3-8 hour period. To open a Corruption Morph Box, you will need to deal a set amount of damage to enemy players in PvP. Corruption Morph Boxes, on the other hand, are a little trickier to earn and open. Corruption Boxes are available every 24 hours in Power Rangers: Legacy Wars. To unlock a Corruption Box, you will need to deal a set amount of damage to your opponents in PvP battles. You’re able to spread this damage out across multiple fights, which means that even if you lose, your progress will still count towards unlocking your Corruption Morph Box. The amount of required damage to open your Corruption Morph Box can be seen below the Corruption Morph Box at the top right corner of your home screen. Power Crystals are often included in the Special Offer of the day. 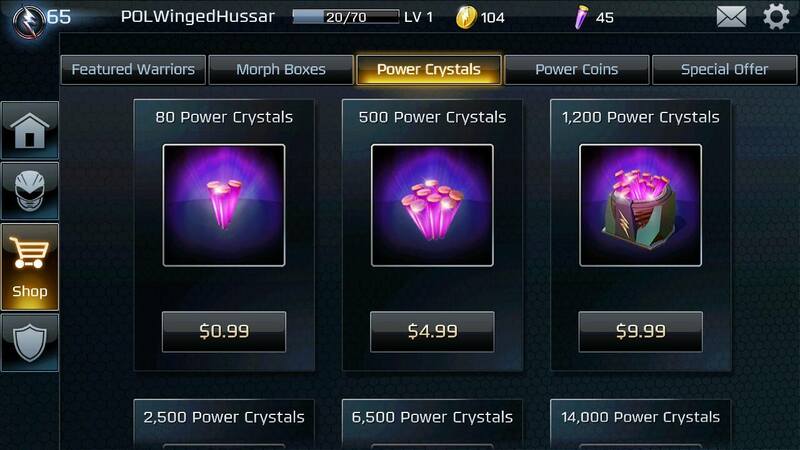 Another way you can earn more Power Crystals in Power Rangers: Legacy Wars is by purchasing Special Offers via microtransaction. Special Offers are rotating in-game bundles which can include items such as new Warriors, Power Coins, and Power Crystals at one set price. For example, today’s Special Offer is the Green Ranger Ultimate Starter Pack for $9.99. In this pack, you get the Green Ranger, 5,000 Power Coins, and 1,200 Power Crystals. If you don’t like a particular Special Offer, simply log back in the following day for a brand new Special Offer. When in doubt, you can always purchase Power Crystals outright. 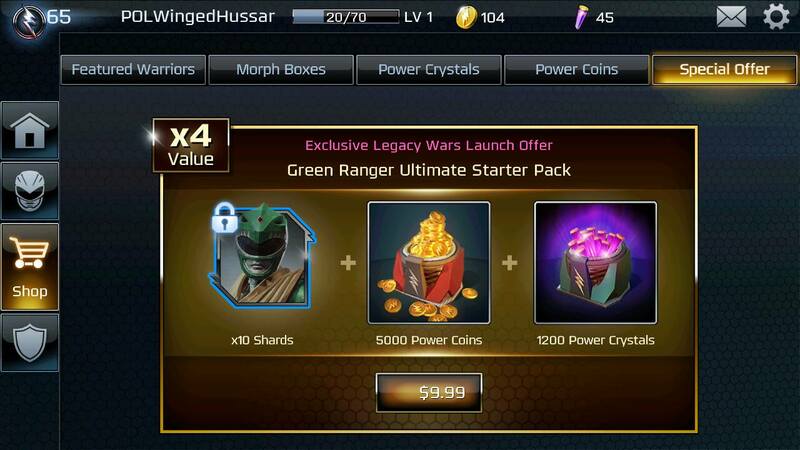 Finally, the easiest way to earn more Power Crystals in Power Rangers: Legacy Wars is to purchase them outright. As with any free mobile game, microtransactions are an inevitability. If you don’t wish to grind through achievements and Morph Boxes, and you aren’t interested in the game’s Special Offers, you can purchase Power Crystals by tapping on the shopping cart icon. 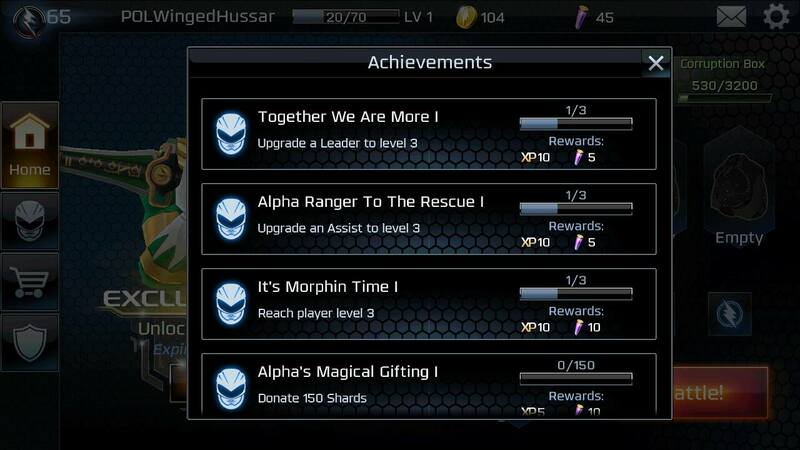 As of right now, the only way you can earn more Power Crystals in Power Rangers: Legacy Wars is by completing achievements, opening Morph Boxes, and purchasing them either outright or as part of a Special Offer.